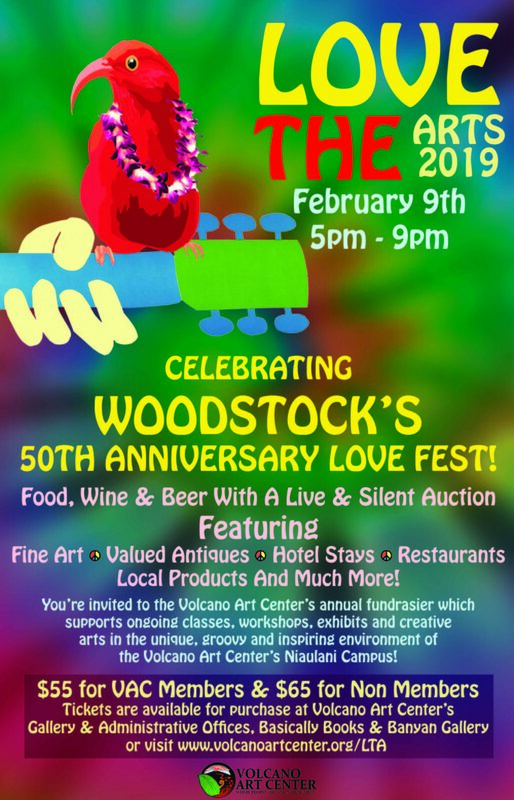 Volcano Art Center announces our 15th Annual Love the Arts fundraiser at the Ni‘aulani Campus on Saturday, February 9, 2019 from 5 – 9 pm. This annual gala is our main event to raise funds for Volcano Art Center which allows us to fund classes, exhibits, workshops, and offer the creative arts experience in this uniquely nurturing and inspiring environment. This event is highlighted by unique decorations, delicious food, fine wines, and of course the live and silent auctions. Everyone will have an opportunity to bid on artwork, hotel stays, restaurants, local products, services, gift certificates to businesses and attractions. 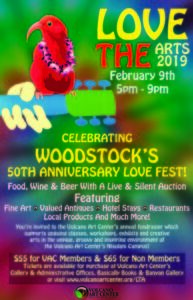 Our theme this year is celebrating 50th Anniversary of Woodstock with music, memorabilia, tie-dyed bell-bottoms and beads. So raid your closets and come join us for what will be a groovy evening. Guests will be treated to an evening of fine wine, brews, and a luxurious gourmet buffet. The live and silent auctions are not to be missed, with unique offerings including original artwork, hotel stays, tours, and jewelry.